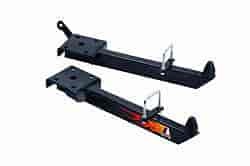 These rugged suspension bars are designed for leaf spring suspensions and can be used for street or strip. Traction is greatly increased, wheel hop is eliminated, and the rubber snubbers provide a better ride. In order to retain use of rear stabilizer bar, each end of bar must be trimmed approximately 1/2". Does Lakewood 21607 fit your vehicle?